Affordable New York City movers should not require Sherlock Holmes to find. 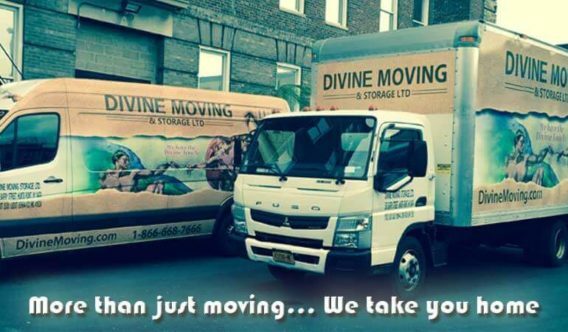 Divine Moving takes the stress out of moving in New York City. We are Manhattan's best resource for certified, licensed, and insured movers. Our professional and expertly trained movers handle your possessions with the utmost precision and care. If it's valuable to you, it's valuable to us. No job is too big nor too small. We take care of moving your office, gallery, warehouse or store, so you can keep your focus on running your business with minimal interruption and arrive at your new location ready to get to work! Our modern state-of-the-art storage facility offers 24-hour security and climate-controlled environment. We ensure your belongings are safe and secure, so you can worry about other things--like finding your new home. As NYC’s most trusted moving company, we provide a seamless transition to your new home. Manhattan has been our home for almost 20 years, and we want you to feel like family-- and family takes care of one another. Let us take care of you! NYC Top Choice for Safe.Reliable.Hassle-Free Moving and Storage- Where Moving Day is a Pleasure! LOCATION Our NYC offices and warehouses are highly accessible. We can accommodate all your needs for moving and storage in Manhattan and the New York City metropolitan area. SECURITY Our state-of-the-art storage facility offers 24-hour security with fire and theft protection, smoke alarms, constant video surveillance, and motion detectors. Our clean, temperature-regulated and climate-controlled warehouses are perfect for storing your belongings for short or long term. STORAGE—NY STYLE! We have storage rooms designed especially for NYC apartments from studios and one bedrooms to galleries, offices and even warehouses —for short or long-term stays. Our Manhattan moving crews will take detailed inventory of your possessions, ensuring they are safe and secure and their location is always accounted for. FULL SERVICE We are a full-service NYC moving, packing, unpacking, and storage company. Whether you just want us to pick up and move your items or you need us to bring and pack boxes for you, we can accommodate all of your needs. We offer free consultations to help you determine the most efficient and cost-effective way to move. SATISFACTION Our number one priority is customer satisfaction. We have built our company on referrals and repeat customers, which we only get if we provide a superior, stress-free, and affordable moving experience, for new and returning clients. Spring break in NYC – how to spend it?